He's always been an old soul, my first-born boy. But there are moments where he seems much older than almost five. Like when we happen upon a Memorial Day ceremony where veterans carry our flag and share stories of lives that were laid down for country's freedom and my oldest listens intently as I give him the run down of the celebration and solemnly puts his hand over his heart as we recite the Pledge of Allegiance and sing the National Anthem. Or when he and his younger brother are out in the back yard and the little one ends up haphazardly crying from a minor injury and my oldest boy rushes to his side asking if he's OK and envelopes his tearful brother in a hug. 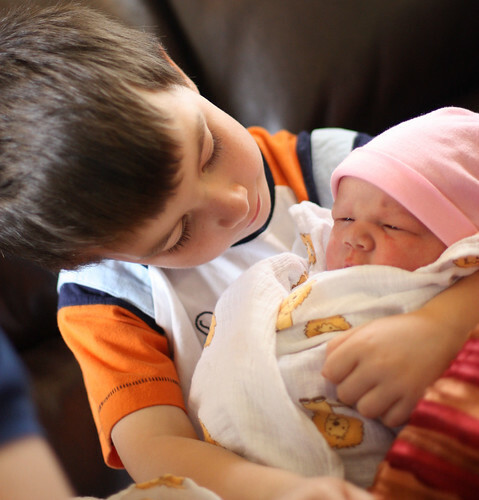 And just today while he's snuggling his 9-day-old baby cousin -- she lets out a cry, he presses his lips into her forehead, giving her a kiss and says, "It's OK, baby, I'm here, and I'm taking care of you." It's like he gets it. So much of it -- in ways I don't fully comprehend, and in ways that only my heart really can interpret and fumble to translate for my brain. who gets it -- so much of it. And I'm taking notes from him as fast as I can scribble them out and press them into my mind for keeping. Pile of goo, here, too. Thanks for melting with me, Lu. It's probably what stuns me the most about parenting: how much these little ones can teach us. Your big boy has a tender, wonderful heart. Tender hearts of our little ones bring me to my knees in awe. What a sweetheart!